"A great tale of adventure and romance, beautifully imagined and deeply engaging from beginning to end!" Celia Montrose has been trained to deal with any emergency--except being thrust into another world. Crisis management training hasn't prepared her for meeting the Viking descendants of the lost Vinland colony, or coping with kidnapping, murder, and magic. Lord Dahleven is preparing for war when he rescues a strange and beautiful woman in the drylands. Though he fears Celia may be Fey-marked, Dahleven can't resist the powerful attraction he feels for her. But is Celia in league with the enemy, or will she provide the key to saving his people? Alone and off-balance, Celia finds herself falling for Lord Dahleven. But dangerous forces are at work, and one of them is offering Celia a way home--for a price. 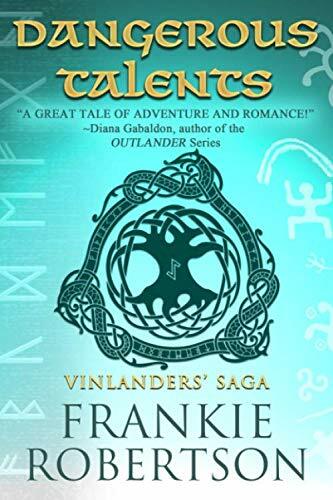 Book 1 in the Vinlanders' Saga, a fantasy romance adventure series inspired by Norse mythology and featuring the descendants of Viking warriors. Contains scenes of magic and sensual romance and is not appropriate for younger readers. I'd love to let you know when the next Vinlanders' Saga title is released. Sign up for my occasional newsletter at FrankieRobertson.com and receive two free short stories!